Apple's iOS ecosystem is on course to generate over $1 trillion in revenues for the company by the middle of this year, according to Asymco analyst Horace Dediu. Dediu's prediction is based on several factors, starting with an expectation that Apple will have sold at least 1.2 billion iPhones in its first 10 years, earning it the rank of "most successful product of all time" and laying the foundations for the company's iPad, Apple TV, iPod touch, and Apple Watch categories. Dediu claims revenue from iOS device sales will total about $980 billion by the middle of this year, and adds to that estimate more than $100 billon in revenues from supporting services (including app content sales), putting the ecosystem's total worth above the $1 trillion mark. The analyst notes this excludes payouts to iOS app developers of around $60 billion, with the rate of payments now reaching $20 billion per year. Those numbers would appear to tally with comments made by Apple CEO Tim Cook last August that the company has paid out more than $50 billion to developers over the lifetime of the App Store, which first launched for the iPhone in 2008. Dediu points to the locked-in nature of Apple's ecosystem ensuring the iPhone's resilience and longevity, despite strong competition from so-called "iPhone killers" that come and go, while its robust feature set and attached services continue to earn it the market reputation as the premium smartphone to beat. In addition, the analyst claims that Android users are now more likely to switch to iOS rather than the other way around – a trend supported by previous reports from both market analysts and Apple, including, notably, comments made in the company's Q4 2016 earnings call. Dediu ends by predicting not another "Big Bang" for the iPhone, but a "process of continual improvement" as the smartphone enters its second decade. Indeed, the analyst expresses more excitement for its network of "ancilliary smart accessories" like the Apple Watch, the AirPods, Apple Pencil, and other possible new wearables that point toward a future where the iPhone is a hub to a mesh of personal devices. "The seamless integration of such devices is what has always set Apple apart," Dediu concludes. In an alternate, but very possible universe, the iPhone got crushed by Android. Developers flocked to Android-first or Android-only. Apple tried to stop the hemorrhage by creating cheap iPhone models, that ultimately devalued the brand, thus spiraling down even more. 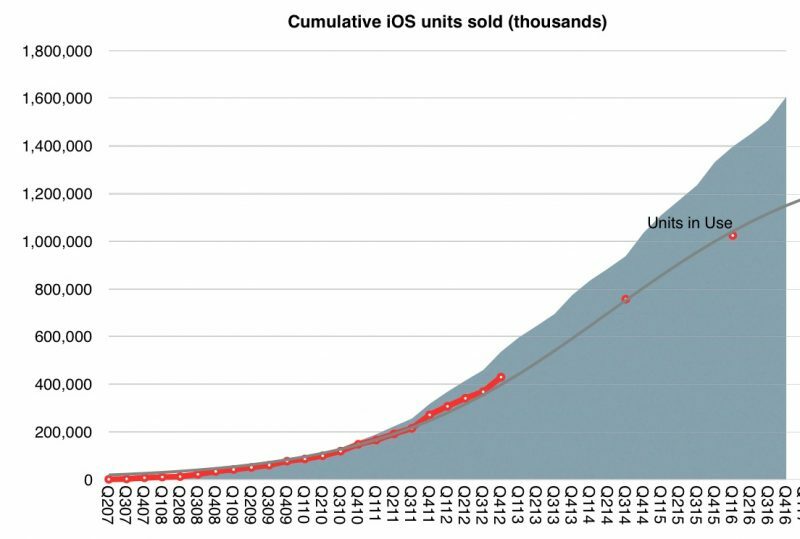 In this universe, thankfully, Apple is a very well run company, and the iPhone thrived, leaving only the market scraps to the competition. It seems that 3/4 of the people on this forum think that Apple is doomed and Tim Cook should be fired, and that the key to Apple's turnaround is to turn the iPad into a Surface Pro and to make Macs more like Hackintoshes. No amount of evidence, such as this article, will convince them that Apple is doing fine and making good choices that are popular with customers. They want their inch-thick iPad with mouse support and a file system, they want their Mac with a GTX 1080. And unless Apple delivers these things to them ASAP, Apple is doomed and Tim Cook is the worst. Loved your humor and thinking in this post but I have to make one correction. From the front lines (consumers with educational background in business) it seems that Apple has gone "stale", possibly when they released the first apple watch that was far from impressive (still own S0 and S2 so not bashing). I don't feel like looking up the video but look back at Tim Cook saying "we have amazing products in line to release this year", well we got the S2 which got minor tweaks (love it though), another iPhone with practically the same features plus a non-physical home button, and a MacBook that really isn't that impressive for how long the wait was. We didn't get anything from any of the other product lines, we didn't get anything "new", and nothing earth shattering as Cook seemed to have hyped it up, and we actually lost product lines like the monitors. This isn't a bash on Cook or an Apple was better with Jobs rant, just saying that the hype didn't seem to deliver last year like it was supposed to. *this is a quasi-bash on Cook's Apple. Which makes zero business sense, because we NEED the Mac and Xcode to create those spiffy apps in the first place. When your only money making item is a phone and you have no other diversity, you can only ride that wave for so long before it vanishes. Apple is skating on thin ice and they need to diversify and bolster their current offerings and stop relying so heavily on ONE device to keep them going. The iPhone is far from being the only profitable business of the firm. At the contrary, every sector Apple competes in is profitable, from Services, which are enormously up YOY, to the Apple Watch (it's the size of Rolex), to Beats hardware to the iPad to obviously the Mac. Not to mention the billion-dollar business just launched with the AirPods. Contrast this to Google, Facebook that get >95% revenues from the advertising trick. Everything else they do is losing them vast amounts of money, just check out Alphabet X' impressive list of high profile failures. The iPhone is huge and unmatched, so all the other revenue streams look small in comparison, but having a huge and unmatched business is not a liability, it's a plus. Considering you are in this ecosystem for a while, I wonder what app was worth of being the only one you ever spent money on? Care to share? In this universe, thankfully, Apple WAS a very well run company, and the iPhone thrived, leaving only the market scraps to the competition.